There have been many, many films that have given audiences a scare in the theater, but one of the very first was Frankenstein. It was by no means the first horror film ever made, but it was the one most responsible for turning Universal into a monster machine, even more so than Dracula, pumping out horror films for the next thirty years. Some were met with great success and some were not, but no one can argue about the importance of James Whale’s tragic tale of a monster brought into the world against his will and the consequences of meddling with the nature of things. Even today, eighty-three years onward, the film still strikes a chord within the viewer. It may not have as much of an impact as it once did as people today have become so immune to the darker side of humanity, but it is still frightening in a primal kind of way. The science may be flawed as it requires more than just the piecing together of body parts and a little electricity to animate a corpse, but when the monster awakes, when he stirs for that first time and he comes alive in all his bestial glory, there is a moment when you think that it may just be possible to do the impossible. 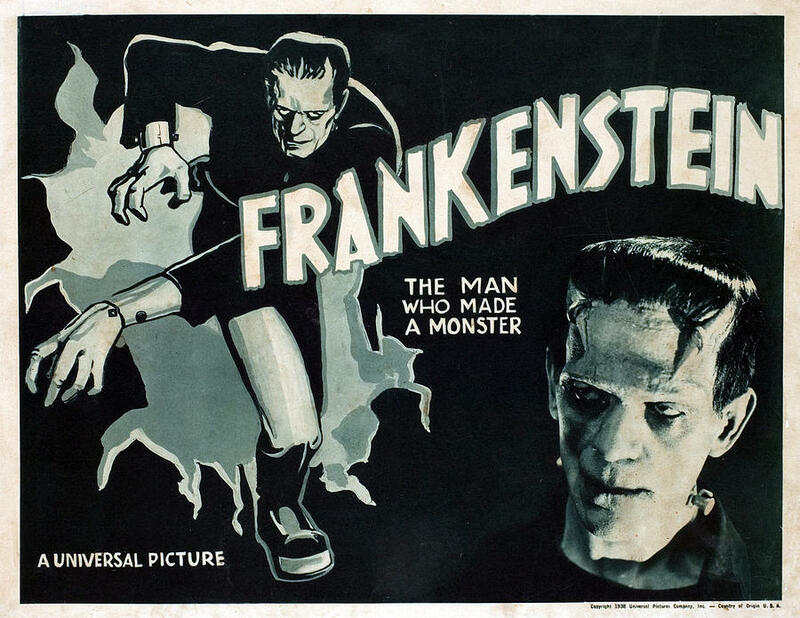 Adapted from the book by Mary Shelley, loosely of course, it details Henry Frankenstein’s trials and travails to create a man much like God did, to prove that science is able to create life much in the same way as nature. At times, Henry seems quite mad and thanks to the brilliant performance of Colin Clive, we believe it to be so. His fiancée is unnerved at what he is doing; not really knowing exactly what it is, only that it consumes him. And finally, when he is successful, only then does he realize that maybe he made a mistake. Perhaps he was not meant to play God. Soon the monster is antagonized by Fritz, the hunchback assistant, and maybe he might not have been had he been given a normal brain instead of that of a criminal. So it is that he escapes and heads off through the country and the outskirts of town creating havoc wherever he goes. Boris Karloff as the creature gives the performance of a lifetime. Part of that can be attributed to the script by Peggy Webling, Garrett Fort, and Francis Edward Faragoh, partly to his abilities as an actor, but also perhaps partly due to not wanting to sit in the makeup chair any longer than he had to. His performance is sly and understated for most of the film. He is imposing and it is his silence that is most frightening. The way Karloff leans forward when he stands, as if he is a tree about to fall over, combined with the size of his boots and his overall physical presence really create an air of the unearthly about him, as if he is not meant for this life. 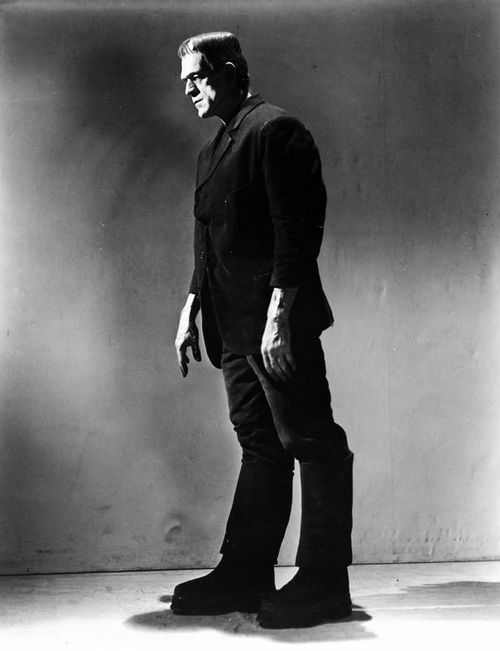 The casting for the part of the monster was perfect, not only because of Karloff’s height, but because the man had genuine talent and it showed in every scene of the film. Starring as the creature would launch Karloff’s career and he would go on to appear in numerous features, both in the horror genre and without. He would play mad doctors and monsters of the human variety, but none so memorable as Doctor Frankenstein’s poor creature. There are a number of things that can contribute to making a successful horror film such as lighting, cinematography, pacing, the writing, the acting and more. The horror aspect of this film becomes apparent from the first moment as the opening scene is in a graveyard. It sets the stage for the rest of the film to follow with its look at life and death and creates an interesting juxtaposition by doing so. The good doctor’s madness is another factor that adds to the overall effect of the picture, especially when the creature is awakened. But the real horror is truly not in full swing until the creature escapes the castle and starts to encounter the populace. 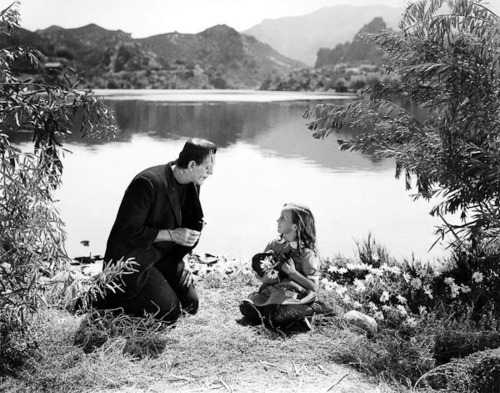 One of the most frightening scenes in all of cinema, and one of the first big scares an audience would be exposed to thanks to this movie, is when the creature encounters Maria, the little girl near the lake. She is unafraid and it looks as if she might be the one to tame the savage beast. But the monster’s brain is incomplete and he does not understand what he does when he picks her up and throws her into the lake. Even scarier is when he just turns his back and walks away, not knowing what it is he has done. Another moment almost as memorable, but nearly as frightening is when Henry and the creature stand upon the hill staring at each other face to face. You can see the fear in Henry’s face and the complete lack of anything resembling human emotion, except perhaps rage in the monster’s and you know that only one can survive the impending confrontation. Coupled with the lighting and the set design, it is one of the very best scenes in the movie representing not only a battle to come, but that battle between life and death as well. 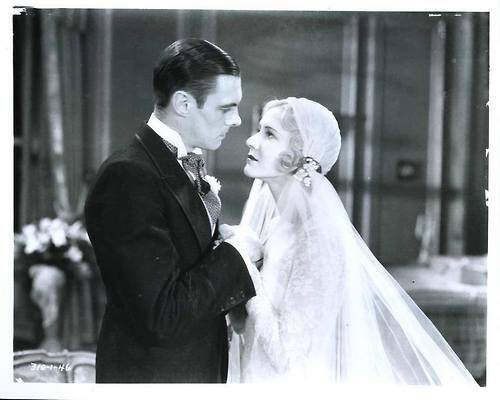 The rest of the cast did an admirable job trying to stay out of Karloff’s shadow such as Mae Clarke who played opposite Clive as the female lead. Frederick Kerr as the good Baron and Henry’s father was quite humourous and added a little brevity to the film. Fritz the hunchback was played by Dwight Frye and was perhaps the weakest part of the entire film if one had to be found. At times when he is in the dungeon and torturing the monster, he is standing upright which ruined the effect of his costume, making it seem like he was just a guy with a pillow stuffed up his shirt. Where he was brilliant in Dracula, he was not so much here. Colin Clive of course, who portrayed Henry, was electric in his role as the misguided scientist. He can also be said to have played the first, and most prominent, ‘mad doctor’ roles ever seen on film. His film career sadly, would be a short one though he will always be remembered for his performance in this film and in the sequel. Frankenstein, even though made so long ago but also because of it, is an iconic film and one that popularized horror for the masses. 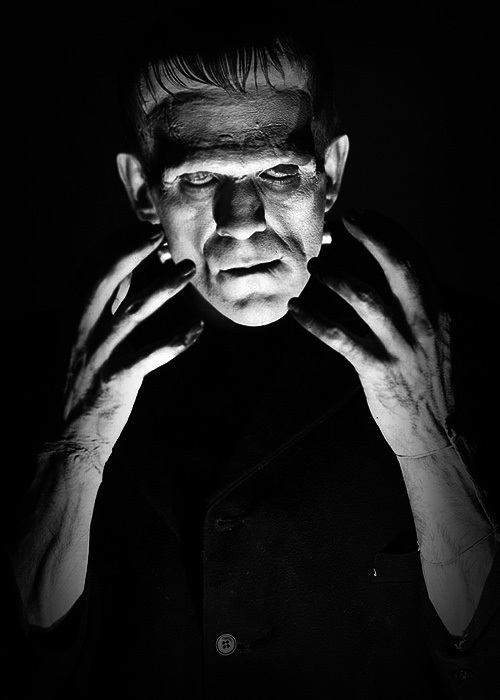 While Lon Chaney innovated makeup design and created many memorable creatures such as the Phantom of the Opera before this film was even in the conception stages, the Frankenstein Monster is the quintessential face of horror. There have been numerous creatures and monsters since 1931 to have made an impact, but none of them would have the same effect as Karloff’s monster even to this day. 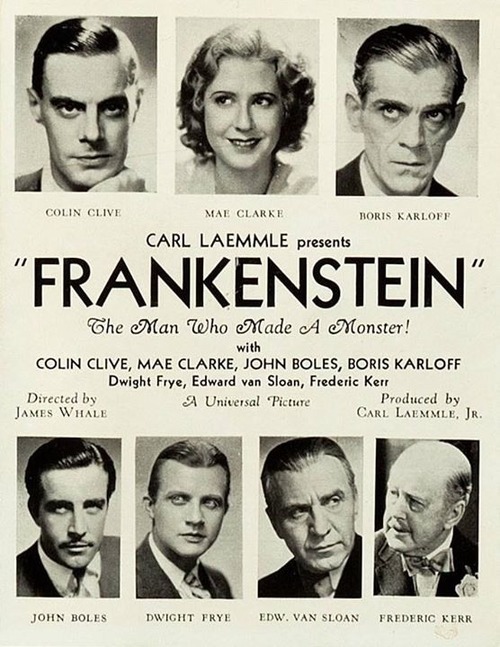 Because of the success the film would generate, a sequel was obvious and James Whale, the director would return for it as well as go on to direct another Universal monster movie, The Invisible Man. Great does not even come close to describing how good this film. It shattered the preconceptions of what horror could do and could be and stands as a monument for all that would follow.